Christmas is one of the best holidays for adults and children alike. As Christmas approaches, there are plenty of magical Santa events and lots of entertainment within Cheshire this year. Father Christmas himself together with his elves will take residence at Chester Storyhouse from 22nd November to 23rd December. The Santa event will take place on Thursday (1 pm – 7 pm), Friday (1 pm – 6 pm), and weekends between 11 pm and 5 pm. Tickets for the event cost £3.50 per child. Santa will narrate stories to children throughout the day while the elves help the young ones take part in art and craft workshops or to list down their Christmas wishes. Grosvenor Shopping Centre has organised a festive Santa’s Grotto for families in the region. The Centre will host Father Christmas every weekend from 24th November. The grotto tickets cost £5. For every ticket, 50p will be channelled to Macmillan Cancer Support. Apart from meeting Father Christmas, the children will take part in counting competitions. They will count the festive characters on the path to Santa’s Grotto. Grosvenor’s own elves will be there to support. On weekdays, the Shopping Centre will host a free animatronic storytelling Santa and singing reindeers. Santa will share reads with shoppers along St Michael’s Row. Every Thursday, Grosvenor Shopping Centre will stay open for late night shoppers. Santa Grottos this year will happen at the hearth of Reindeer Lodge. The new spot is beaming with freshwater streams, lakes, woodland walks, and paddocks. The event will run from 1st December to 24th Dec, with December 22-24 being the climax. Tickets for children from 22nd December will cost £19.25 while adult tickets cost £15.95. On other days, the ticket price for children and adults will cost £15.95 and 12.65 respectively. Tickets must be pre-booked online before visiting Reindeer Lodge. During the event, families will meet Father Christmas in an amazing Santa’s Grotto and take part in several fun activities. The ticket price will cover entry into the lodge, donkey rides, interaction with reindeer, entry to Santa’s Grotto and the Elf Stage Show. Child ticket holders will be given age-appropriate gifts. On top of this, you will have lots of opportunities to take photos with Father Christmas, elves, reindeer, and sleighs. The Lodge has a candy and gift shop. The Ice Cream Farm is another place that will host Santa and his elves. Early bird offers are available at £8 per child on 24th and 25th November. The regular price for a ticket is £10 per child. The Farm invites people to book in advance and indicate the date they wish to visit. 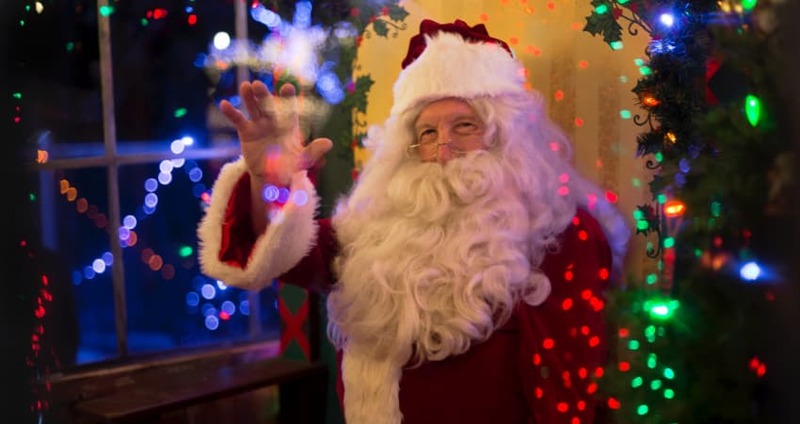 The Quarry Bank hosts a special Father Christmas event for children less than ten years. The kids’ event will focus on crafts, storytelling, and dressing up, and it will run for from 10.30 am to 4.30 pm on selected days between 1st December and 23rd December. The 30-minutes sessions will happen on the top floor of the Exhibition Space. The ticket costs £9 per child, but it is free for up to two adults per child ticket. If you are a member of the National Trust, entry is free as long as you carry your Quarry Bank admission ticket. As you plan for this event, note that dogs are prohibited. The Centre will host a charity grotto that will be available on selected days from 1st December to 23rd December. The event will be open from 11 am to 5 pm on weekends and from 2 pm to 5 pm on weekdays. Tickets for the event are available online, and they cost £7.50 per child. Each ticket covers entry, 2 free adults, and a gift from Santa. You must specify your time lot when purchasing your ticket. Blakemere will host Father Christmas this year in an outdoor theatrical setting at the hub of Cheshire woodlands. The event will run from 8th December to 24th December, and it will be open daily from 10 am to 5 pm. The Santa event will run for 3 hours and will feature several woodland characters. Tickets for the event cost £27.50 per person for the Ultimate Santa Experience Package and £19.95 each for standard Santa Experience. The standard package covers for interaction with Father Christmas, magical theatre in search of Santa, an opportunity to take photos with Snowy the Owl. The Ultimate Santa Experience package has everything in the standard package plus kitchen craft activity with Mrs Claus, outdoor festive treats, a gift for each adult, and an unlimited family skating. The Farm will host Father Christmas this year from 1st December to 23rd December on weekends. It will be open from 11 am – 4 pm. Tickets for the event cost £6.50 per child and £7 for adults. There is also a vehicle park entry charge. No-pre booking is required to visit the farm. During the festive event, children will meet Father Christmas together with his elves. On top of this, music from brass bands and the storyteller will keep children entertained. Children can meet Father Christmas at Visitor Centre. The Santa event will happen on Sun 16th December from 10 am – 3 pm. The event organisers only sell tickets for children. But, each child ’s ticket gets 2 free adults entry. A single ticket for a 10-minutes slot cost £6. Two child tickets for the same 10-minutes slot cost £10 while three child tickets for a 10-minutes slot cost £14. During the event, the children will take part in searching for Father Christmas’ helpers. You can get an ‘Elf Hunt’ map from Tegg’s Nose Tea Room to help you explore the park. There are also several festive treats at Tea Room. With the Christmas rush on you could save yourself the extra hassle of parking or transporting a gaggle of kids around to meet Santa. Chester Taxis offer safe and reliable transportation around Cheshire, including 8 Seater Minibuses and wheelchair friendly taxis. All of our Chester taxi cars and Chester taxi minibuses are regularly maintained and are fully equipped with the latest safety features; these include first aid kits, 3 point seat belts, and fire extinguishers. With several Santa events in Cheshire, you can be sure that this will be a Christmas to remember. Make sure to book early to avoid regrets as demand is usually high. Also, keep in mind that weather can be unpredictable, so choose suitable winter clothes and footwear like warm hats, walking boots, and gloves.